This is an example of what you get in each lesson. Watch the video and check out the teacher guide, student guide, slides and tests below to get a taste of what's included. What is the Wild World of History Curriculum? Our Wild World of History curriculum is based entirely on the New York Times #1 bestseller A Patriot’s History of the United States by Larry Schweikart and Michael Allen. It is the #1 high-school level history book of choice for homeschoolers in America. The curriculum also makes use of The Patriot’s History Reader, which contains the original documents of American history—the Declaration, Lincoln’s Inaugural, and so on. We have a sample video lesson and sample documents for you to review. A teacher’s guide, providing “learning objectives,” recommendations for visual aids and videos, the full outline of each chapter in Patriot’s History, and activities.These are all tailored with Advance Placement tests in mind, so that in each chapter there are sections called “Learning at a Higher Level” that challenge more advanced students with questions not solely answered by the book. These sections also make regular references to the Reader. A student guide, which contains the same chapter subheader outlines with plenty of room to write answers. A test booklet, complete with both objective multiple choice questions, a “documents based question” for every section—the essential component of all Advanced Placement exams—and an additional optional essay question designed again for advanced learning and AP. A video series with Larry Schweikart teaching all 22 chapters from Patriot’s History in 40-minute to one-hour lessons. Each lesson, while coordinated closely with the book Patriot’s History, offers more detailed discussions about key concepts and additional material not found in the book. A “blackboard” in the back on which all maps, visual aids, and photos appear. This “blackboard” also has on the left side a timeline. (Every video lesson begins with a timeline). On this timeline is a little “chalk” image of a globe, which moves to wherever the lesson is at the moment. For example, when discussing the Land Ordinance of 1785, the “globe” is on the year 1785. But if I say, in the video, “Let’s jump ahead to 1787 and see how this plays out with the Northwest Ordinance,” the “globe” moves with us to 1787. Then back, as needed. You will never be out of place or out of “time” in the lessons and the student will always know the date of the subject under discussion. All images and maps are available in a separate PDF along with the Teacher’s and Student’s Guides for map exercises or other activities. All videos are divided into three (usually equal) “themes” or topics of about 15-20 minutes each. This is for the purpose of attention span. If you need to take breaks, say, teaching the “Confederation” on Monday, the “Constitution on Wednesday—you will have no trouble determining where you are. A sample of Lesson 4/Chapter 4, “A Nation of Law,” is provided on the site. It begins with the subheader “Highways and Wolves” and moves through “Chaos and Patriot’s to the Rescue” and ends with “Beyond the Endless Mountains” and a discussion of the Land Ordinance of 1785. Each lesson involves me teaching, either to a live audience or to the camera, interspersed with visual aids and maps shown on the TV screen behind me. Are there other features of the curriculum? Absolutely. The most important aspect of this curriculum—other than its content—is that it is digital and fully down-loadable. It is yours when you buy it. If you have three children who need to be homeschooled, you buy it one time. There is no license that expires. Need to print off more than one copy? It’s yours. Print as many as you like. What else is available with the curriculum? I’m glad you asked! Once a month, Larry Schweikart will engage in a “call-in”/email-in web chat about any problems you may have teaching the curriculum—or about any historical topic on your mind. Can I purchase a hard copy? Yes, of course, but we prefer you purchase the digital version and use it as needed. However, if you want us to print and bind the full curriculum and mail it to you, we will do so for the cost of printing and mailing. How do I purchase the curriculum? OK, I’m sold. Is there more? Please provide your email address so we can send you "Example / Sample of American History Lessons". One last step before we send your example! 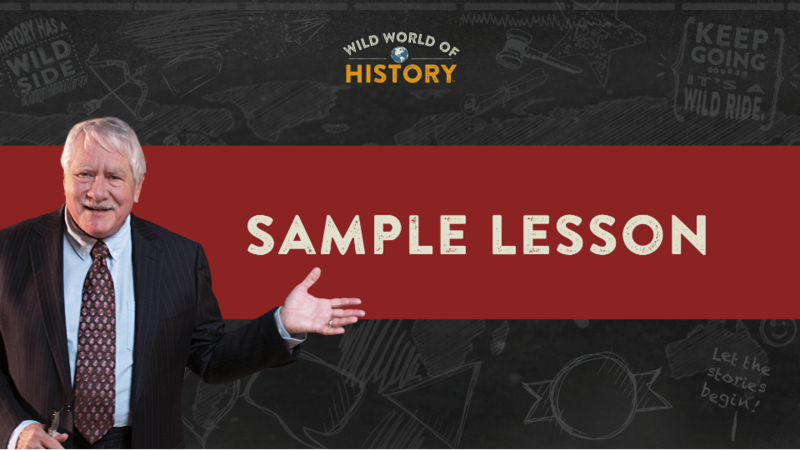 A link to "Example / Sample of American History Lessons" was sent to Make sure the email arrives in your inbox: either add "support@wildworldofhistory.com" as a safe sender to your email platform, or if you use Gmail, drag our email into your Primary tab.